Essential ViewingThe Week in RewindThere was plenty buzzing in the news cycle this week-especially about Osama bin Laden. After a challenging week, President Obama and First Lady Michelle Obama had some fun at a Cinco de Mayo celebration at the White House. Meanwhile, our favorite celebs were seen dressed to the nines at several events coast to coast. 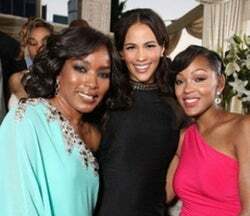 In L.A., Angela Bassett, Paula Patton, and Megan Good shared a special moment at the premiere of 'Jumping the Broom. 'In New York City, stars such as Beyonce, Jay-Z, Alicia Keys, and Rihanna rocked the red carpet at the Metropolitan Museum of Art Costume Gala 2011. Take a look at what else the stars were up to this week.First Lady Michelle ObamaFirst Lady Michelle Obama does a little dance after President Obama joked with her during a Cinco de Mayo reception. Obama said, 'You do not want to be between Michelle and a tamale. 'Andre Leon TalleyOnly Andre Leon Talley could get away with wearing such an extravagant robe to the Costume Institute Gala at The Metropolitan Museum of Art in New York City.Matthew Broderick and Anika Noni RoseMatthew Broderick and Anika Noni Rose announce the nominees during the 65th Annual Tony Awards nominations announcement in New York City.Aretha FranklinAretha Franklin gives a soulful performance at the Candie's Foundation 2011 Gala at Cipriani's in NYC.Beyonceand Jay-ZBeyonce, with husband Jay-Z, flaunts her curves in this embroidered Emilio Pucci gown at the Costume Institute Gala in New York City.BeyonceBeyonce gets her groove on during a surprise visit at PS/MS 161 in Harlem as part of First Lady Michelle Obama's 'Let's Move' initiative to fight childhood obesity.Amar'e Stoudemire and CiaraAmar'e Stoudemire and Ciara make a beautiful couple at the Candie's Foundation 2011 Gala at Cipriani's in NYC.Eva MarcilleEva waves to photographers while running errands in Beverly Hills. Her look is totally chic!Halle Berry and NahlaHalle Berry and Nahla go grocery shopping in West Hollywood, CA.It's always good to them out and about spending time together.Idris ElbaIdris Elba looks handsome on the red carpet at the 'Thor' Movie Premiere.Janelle Monae and Bruno MarsJanelle Monae, here with Bruno Mars, rocks the red carpet in head to toe Chanel at the Costume Institute Gala in New York City.Jennifer HudsonJennifer Hudson looks adorable in this baby doll dress while out and about in NYC.Jill ScottESSENCE Music Festival headliner Jill Scott is red hot at the2nd Annual Mary J. Blige Honors Concert in New York City.Arlenis Sosa, Sessilee Lopez and Jourdan DunnModels Arlenis Sosa, Sessilee Lopez and Jourdan Dunn look great on and off the runway as seen here out and about in Manhattan.June AmbroseJune Ambrose puts her twist on classic turquoise and coral at the Design on a Dime benefit.Judith JamisonJudith Jamison, outgoing Artistic Director of Alvin Ailey American Dance Theater, attends the Ailey at the Apollo 2011 Spring Gala Benefit.Kimora Lee SimmonsKimora Lee Simmons shows some affection with her hubby on her 36th birthday in L.A.Carmelo Anthony and Lala VasquezCarmelo Anthony and Lala Vasquez look stunning as they attend the White House Correspondents' Association Dinner in Washington, DC.UsherLike father, like son. Usher spends some quality time with his son out in NYC.Swizz Beatz and Alicia KeysSwizz Beatz wears Givenchy by Riccardo Tisci while wife Alicia Keys wears Givenchy Haute Couture by Riccardo Tisci at the Costume Institute Gala in New York City.Sanaa LathanSanaa Lathan looks like a goddess at the Film Society of Lincoln Center's presentation of the 38th Annual Chaplin Award.Quincy Jones, Sydney Poitier and Ruby DeThree pioneers in the entertainment industry, Quincy Jones, Sydney Poitier and actress Ruby Dee, attend The Film Society of Lincoln Center's presentation of the 38th Annual Chaplin Award.SadeSade shows off her moves on stage in Belgium. This is her first tour in 10 years.RihannaRihanna swings her long, red locks while out and about this week in New York City.We love her animal print bag.RihannaRihanna looks white hot onstage at the Nivea 100th anniversary celebration in Milan, Italy.Regina KingRegina King shows off her toned armsarrives at the 18th Annual Race to Erase MS event in Century City, California.Raven-SymoneRaven-Symone rocks the runway at the 18th Annual Race to Erase MS event in Century City, California.Paula Patton and Robin ThickePaula Patton and Robin Thicke have a family day while out and about in New York City.Angela Bassett, Paula Patton and Meagan GoodAngela Bassett, Paula Patton and Meagan Good are a perfect trio at the Los Angeles premiere of "Jumping The Broom" in Hollywood, California.Nick CannonNick Canon rushes to by his wife's side during a visit to the hospital to see his newborn twins in LA.President Barack Obama andFirst Lady Michelle ObamaPresident Barack Obama arrives with First Lady Michelle Obama at the White House Correspondents' Association annual dinner in Washington DC. We love Mrs. Obama's hair in soft curls.Mary J. BligeMary J. Blige selected this stunning Gucci gown for the Costume Institute Gala at in New York City.She looks amazing!Mary J.BligeMary J.Blige smiles with her husband Kendu Isaacsat the 2nd Annual Mary J. Blige Honors Concert in New York City.Laz Alonso and Paula PattonLaz Alonso and Paula Patton share a smile at the premiere of "Jumping the Broom" in Hollywood, California.We love this film! This week, our favorite celebs were seen dressed to the nines at several events coast to coast.In L.A., Angela Bassett, Paula Patton, and Megan Good shared a special moment at the premiere of ‘Jumping the Broom.’In New York City, stars such as Beyonce, Jay-Z, Alicia Keys, and Rihanna rocked the red carpet at the Metropolitan Museum of Art Costume Gala 2011. Take a look at what else the stars were up to this week. President Barack Obama speaks as First Lady Michelle Obama looks on during a Cinco de Mayo reception at the White House. Andre Leon Talley wears and extravagant robe at the the Costume Institute Gala at The Metropolitan Museum of Art in New York City. Matthew Broderick and Anika Noni Rose announce the nominees during the 65th Annual Tony Awards nominations announcement in New York City. Aretha Franklin gives a soulful performance at the Candie’s Foundation 2011 Gala at Cipriani’s in NYC. Beyonce, with husband Jay-Z, flaunts her curves in this embroidered Emilio Pucci gown at the Costume Institute Gala in New York City. Beyonce gets her groove on during a surprise visit at PS/MS 161 in Harlem as part of First Lady Michelle Obama’s ‘Let’s Move’ initiative to fight childhood obesity. Amar’e Stoudemire and Ciara make a beautiful couple at the Candie’s Foundation 2011 Gala at Cipriani’s in NYC. Eva waves to photographers while running errands in Beverly Hills. Her look is totally chic! Halle Berry and Nahla go grocery shopping in West Hollywood, CA.It’s good to them out and about spending time together. Idris Elba looks handsome on the red carpet at the ‘Thor’ Movie Premiere. Janelle Monae here with Bruno Mars, rocks the red carpet in head to toe Chanel at the Costume Institute Gala in New York City. Jennifer Hudson looks adorable in this baby doll dress while out and about in NYC. EMF headliner Jill Scott is red hot at the2nd Annual Mary J. Blige Honors Concert in New York City. Models Arlenis Sosa, Sessilee Lopez and Jourdan Dunn look great on and off the runway as seen here out and about in Manhattan. June Ambrose puts her twist on classic turquoise and coral at the Design on a Dime Event. Judith Jamison, outgoing Artistic Director of Alvin Ailey American Dance Theater, attends the Ailey at the Apollo 2011 Spring Gala Benefit. Kimora Lee Simmons shows some affection with her hubby on her 36th birthday in L.A.
Carmelo Anthony and Lala Vasquez look stunning as they attend the White House Correspondents’ Association Dinner in Washington, DC. Like father, like son.Usher spends some quality time with his son out in NYC. Swizz Beatz wears Givenchy by Riccardo Tisci while wife Alicia Keys wears Givenchy Haute Couture by Riccardo Tisci at the Costume Institute Gala in New York City. Sanaa Lathan looks like a goddess at the Film Society of Lincoln Center’s presentation of the 38th Annual Chaplin Award. Three pioneers in the entertainment industry, Quincy Jones, Sydney Poitier and actress Ruby Dee, attend The Film Society of Lincoln Center’s presentation of the 38th Annual Chaplin Award. Sade gets physical on stage in Belgium.This is her first tour in 10 years. Rihanna swings her long, red locks while out and about this week in New York City.We love her animal print bag. Rihanna looks white hot onstage at the Nivea 100th anniversary celebration in Milan, Italy. Regina King shows off her toned armsarrives at the 18th Annual Race to Erase MS event in Century City, California. Raven-Symone rocks the runway at the 18th Annual Race to Erase MS event in Century City, California. Paula Patton and Robin Thicke have a family day while out and about in New York City. Angela Bassett, Paula Patton and Meagan Good are a perfect trio at the Los Angeles premiere of “Jumping The Broom” in Hollywood, California. Nick Canon rushes to by his wife’s side during a visit to the hospital to see his newborn twins in LA. President Barack Obama arrives with First Lady Michelle Obama at the White House Correspondents’ Association annual dinner in Washington DC. We love Mrs. Obama’s hair in soft curls. Mary J. Blige selected this stunning Gucci gown for the Costume Institute Gala at in New York City.She looks amazing! Mary J.Blige smiles with her husband Kendu Isaacsat the 2nd Annual Mary J. Blige Honors Concert in New York City. Laz Alonso and Paula Patton share a smile at the premiere of “Jumping the Broom” in Hollywood, California.We love this film!